Color Blue, Cyan, Green, Pink, Red and etc. Somani Enterprises- Manufacturer, Supplier and Exporter of Yoga Mats. 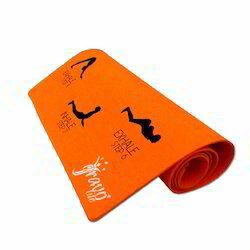 We are also designed Heavy Duty Yoga Mats specially for Corporate, Yoga Institue & Yoga programs. A good quality Yoga Mat is the only requirement to make your Yoga practice comfortable. Color Blue, Green, Purple, Orange and etc. We, Somani Enterprises(India), are highly acknowledged for offering flawless Designer Yoga Mat comes with a premium look and feel in a variety of color and combinations available as per your choice that are easy to wash and handy to move. These Mats are complete solution for your yoga practice, which includes exercises (asanas), meditation and relaxation. We can advice the pregnant woman to keep her yoga practice going on as these Yoga Mats are highly soft and comfortable. Color Red, Blue, Pink, Yellow, Orange, Red, Green, Sky-Blue, Brown, Grey, Purple, Cyan, Cherry and etc. We, Somani Enterprises(India), are highly acknowledged for offering flawless Yoga Mats with Bags to our customers. We are designed and developed using quality approved Eva foam and other allied raw materials to provide optimum comfort to the yoga practitioners. We ensure that your yoga practice remain focused and unhindered using our Yoga Mats. These Mats are complete solution for your yoga practice, which includes exercises (asanas), meditation and relaxation. Backed by several years of industry experience, we (Somani Enterprises) have attained specialization in offering a best quality range of Triple color yoga mats. Our highly skilled and experienced production team makes use of natural raw materials in production of Triple Layer Yoga Mats. Due to slip resistant and softness, these mats are very helpful in keeping yoga practice unhindered. Yoga practitioners will remain protected and safe during their practice as these are very thick. Color Blue, Cyan, Green, Orange, Pink, Purple and etc. Mat Size 24 in x 72 in to 48 in x 80 in with thickness 3mm-12mm. 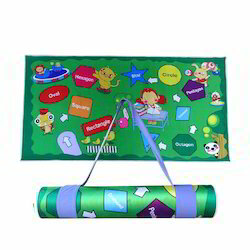 We, Somani Enterprises(India), are highly acknowledged for offering flawless Designe Yoga Mat comes with a premium look and feel in a variety of color and combinations available as per your choice that are easy to wash and handy to move. These Mats are complete solution for your yoga practice, which includes exercises (asanas), meditation and relaxation. We can advice the pregnant woman to keep her yoga practice going on as these Yoga Mats are highly soft and comfortable. Color Red, Blue, Green, Pink, Yellow and etc. Due to our rich experience and knowledge of this domain, we have been able to trade and supply finest quality Yoga Mats. Clients can purchase this mat from us at nominal rates. Backed by several years of industry experience, we have made our strong presence as a manufacturer, supplier and exporter of supreme quality Economic Yoga Mats. 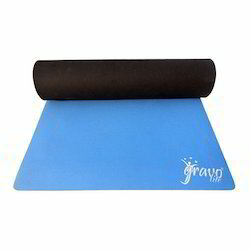 Our professionals design & develop these Yoga Mats using high grade Eva foam in such a way that the yoga students or yoga practitioners remain focused and unhindered during the practice. The Yoga Mats offered by us make the yoga practice complete, comfortable and enjoyable. Our offered Yoga Mats are designed for the complete yoga practice- exercises (asanas), meditation and relaxation. The Yoga Mats (Economy) that we offer you are so soft that even a pregnant woman can continue her yoga practice. Color Red, Blue, Purple, Green, Yellow and etc. Color Cherry, Blue, Yellow, Green, Navy Blue and etc. Being an eminent name in industry, our firm is engaged in manufacturing, supplying and exporting an exclusive range of Sun-Salutation Mats. We offer these mats in variety of colors, sizes, lengths, and designs as per the clients’ diverse requirements. These mats are fabricated suing the soft fabrics, ensure their comforts and reliability. Moreover, these mats can be easily washed by using the carpet shampoos. Color Blue, Cyan, Green, Orange, Purple and etc. Double Layer Yoga Mat comes with a premium look and feel in a variety of color and combinations available as per your choice that are easy to wash and handy to move. 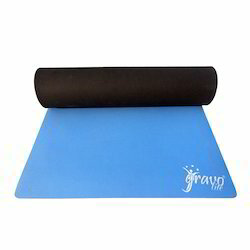 These Superior Shock Absorption and anti skid Yoga Mat has EVA foam filling that cushions you and absorbs shock 100%, so you can enjoy a safe workout session. Color Red, Blue, Green, Orange, Purple and etc. Mat Size 30inch * 78inch with thickness 3mm to 12mm. 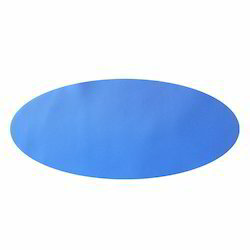 Oval Shape Yoga Mat comes with a premium look and feel in a variety of colors and combinations available as per your choice that are easy to wash and handy to move. 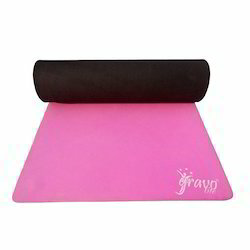 These Superior Shock Absorption and anti skid Yoga Mat has EVA foam filling that cushions you and absorbs shock, so you can enjoy a safe workout session. Moreover the material is water resistant so it stays durable and looks new for a longer period of time and comes with Premium bag and belt, thus easy to carry. Color Red, Blue, Green, Yellow, Cherry and etc. Somani Enterprises- Manufacturer, Supplier and Exporter of Yoga Mats. We are also designed these mats specially for Residential use. A good quality Yoga Mat is the only requirement to make your Yoga practice comfortable. Our Exercise Mats are very soft and easy to use. The major purpose of this mat is to provide comfort to the knee, feet, and ankles. These mats are very easy to wash as it is soft and light. These mats are filled with Kapok and of made using 100% genuine material. 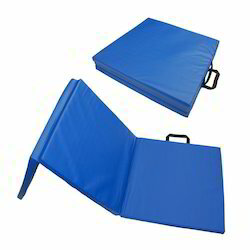 These mats are available in various colors and can be adjusted as per the specific requirements of the user. Backed by several years of industry experience, we have made our strong presence as a manufacturer, supplier and exporter of supreme quality Economic Yoga Mats. Our professionals design develop these Yoga Mats using high grade Eva foam in such a way that the yoga students or yoga practitioners remain focused and unhindered during the practice. The Yoga Mats offered by us make the yoga practice complete, comfortable and enjoyable. 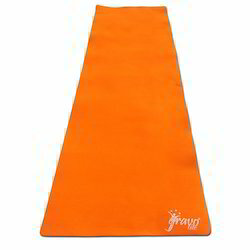 Our offered Yoga Mats are designed for the complete yoga practice- exercises (asanas), meditation and relaxation. The Yoga Mats (Economy) that we offer you are so soft that even a pregnant woman can continue her yoga practice. Color Yellow, Green, Blue, Cherry, Red and etc. For the practice of yoga, you don’t need any equipment except Yoga Mats and for this requirement, you can rely on us. We, Aerolite are known as a leading manufacturer and supplier of Yoga Mats in India. The Yoga Mats that we offer you are designed and made by experienced yoga practitioners using premium quality raw materials to make your yoga practice more comfortable, unhindered and focused. Color Red, Blue, Green, Yellow, Pink and etc. The Yoga Mats – Premium offered by Somani Enterprises are designed and developed using quality approved Eva foam and other allied raw materials to provide optimum comfort to the yoga practitioners. We ensure that your yoga practice remain focused and unhindered using our Yoga Mats. These Mats are complete solution for your yoga practice, which includes exercises (asana), meditation and relaxation. We can advise the pregnant woman to keep her yoga practice going on as these Yoga Mats are highly soft and comfortable. eing an eminent name in industry, our firm is engaged in manufacturing, supplying and exporting an exclusive range of Kids Yoga Mats. We offer these mats in variety of colors, sizes, lengths, and designs as per the clients’ diverse requirements. These mats are fabricated suing the soft fabrics, ensure their comforts and reliability. Moreover, these mats can be easily washed by using the carpet shampoos. We (Somani Enterprises) offer wide range of Aerobic Mats that are available at reasonable prices. The ultimate Mat for durability and comfort combined - New innovative moulded design that means stronger, longer lasting mats - Provides support for spine, hips and other joints - Surface washable but will not absorb moisture. These mats are available in different sizes and can be customized as per the demand of the clients. Color Green, Blue, Red, Purple and etc. 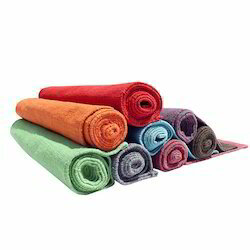 Avail superior quality Cotton Yoga Mats from us at a very reasonable price. We, Somani Enterprises (India), are highly innovative in designing and developing a flawless range of Cotton Yoga Mats. Our professionals are strictly directed to use 100% cotton yarns in the production process of these Yoga Mats. These Yoga RMats are densely woven in a traditional handloom pit. 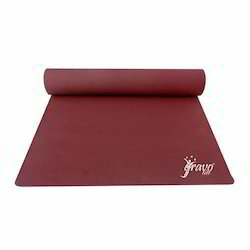 The Yoga Mats offered by us are completely biodegradable, eco-friendly and PVC free. Further, the grip of the Yoga Mat increases as it gets wetter. Color Orange, Red, Green and etc. 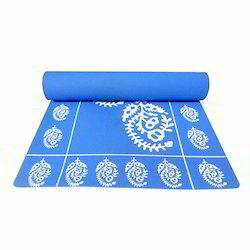 Avail superior quality Cotton Yoga Mats from us at a very reasonable price. We, Somani Enterprises (India), are highly innovative in designing and developing a flawless range of Cotton Yoga Rugs. Our professionals are strictly directed to use 100% cotton yarns in the production process of these Yoga Rugs. These Yoga Rugs are densely woven in a traditional handloom pit. The Yoga Rugs offered by us are completely biodegradable, eco-friendly and PVC free. Further, the grip of the Yoga Mat increases as it gets wetter. Color Red, Blue, Green, Purple and etc. 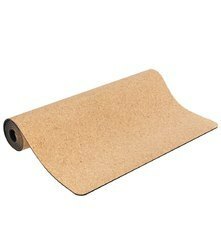 Cork Yoga Mats comes in a variety of colors & sizes and are made up of 100% Virgin Fresh Material. These Durable & Stable Cork Yoga Mats provide best cushioning and absorbs shock, so you can enjoy a safe workout session. Moreover the material is water resistant so it stays durable and looks new for a longer period of time and comes with Cover bag and Yoga Strap, thus easy to carry.